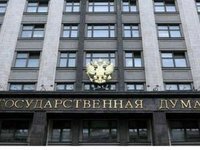 The Russian State Duma has urged national parliaments and European international institutions to use their powers for stopping violence against Russian banks' subsidiaries in Ukraine and to assess Kyiv's conduct from that angle. "State Duma deputies are urging their European counterparts, who have voted for the Ukraine-EU Association Agreement, to efficiently exercise their powers to stop crime and violence and to appropriately assess the conduct of the Ukrainian authorities," the State Duma said in an address to the parliaments of European nations, the European Parliament, the Organization for Security and Co-operation in Europe Parliamentary Assembly, the Parliamentary Assembly of the Council of Europe, and the Council of Europe secretary-general adopted on Friday in the wake of the attacks on banks in Ukraine. The State Duma expressed its "extreme outrage over the attacks on banks in Ukraine, which reached their peak on March 14-15, 2017." These unlawful actions have paralyzed the operations of Sberbank and Alfa-Bank, which have millions of clients and employ several thousand Ukrainian citizens, the appeal said. "Ukrainian law enforcement agencies did not take any measures to stop the illegal actions, thereby jeopardizing the lives and health of bank employees. For the first time in Europe's modern history, employees of financial institutions were in fact walled up inside the attacked offices. The statements made by Ukrainian governmental agencies incited the neo-Nazi assailants to commit illegal and violent actions," the appeal said. "Instead of fulfilling his constitutional duties and ensuring law and order, the Ukrainian president ordered the imposition of sanctions on the financial institutions with Russian capital, which are Ukrainian legal entities registered in accordance with Ukrainian laws, account for a hefty share in the national banking system and comply with Ukrainian legal requirements in good faith," it said. Russian parliamentarians believe that such actions "are at odds with international law and the commitments undertaken by Ukraine at the time it entered into the Association Agreement with the European Union; they are eroding the investment climate in Ukraine and deteriorating the already desperate economic situation in the country."